home Sports The Perfect Formula? We’ve had a lot of buzz around UCC in the past number of weeks regarding the use of plastics and the effects we have on the environment; with UCC having recently opened Ireland’s first plastic-free café. In the last few months, the world has become really aware of just how bad we are polluting the Earth and how fast we are going to have to act to reverse the effects. In honour of that, I thought I’d have a go at looking at where the world of sport has been trying to make improvements and reduce it’s carbon footprint, with the enthralling and ever-expanding sport of Formula 1 and its twin, Formula E, being the best examples that came to mind. Its easy to disregard Formula 1 as being in any way a clean sport, environmentally speaking, imagining the amount of fuel being burned and CO2 being emitted by so many cars. But the engineers behind the machines have been working tirelessly in the last 5 years or so, to clean up the emissions from the cars. Since 2014, Formula 1 teams have been continuously upgrading their equipment and technology, so much so that the average F1 car today uses 35% less fuel than in previous years. A great example of the practical advantage F1 has provided, that we can all benefit from, was the partnership between the Lotus F1 (now Renault) and Boeing. Through the sharing of codes of aerodynamics technology from Lotus to Boeing, it was estimated that a 1% decrease in drag can lead to a 14% decrease in volume of fuel used in aircraft. And further afield, any developments in the world of motorsport trickles down and leads to tangible results for the entire motor industry: our cars benefit from the fuel-efficient technology seen in the sport today. Formula 1 might not have been the eco-friendliest sport to begin with, but if the last decade has shown the world anything, it’s that there is real commitment from the organisers and manufacturers to improve the industry’s effect on the environment. With F1 teams and manufacturers pumping vast amounts, approximately $300 million each year into research and development, F1 is an ongoing workshop dedicated to building cleaner, greener transport technology. If you consider soccer for example, sure, a match day might not emit the greatest amount of CO2 but there are no procedures in place to make the game greener or more sustainable. Imagine how many non-biodegradable shirts are piled up in landfills around the world. And to make matters worse, football teams are actually promoting the sale of even more of these products, which are largely made from fabric derived from non-renewable resources. 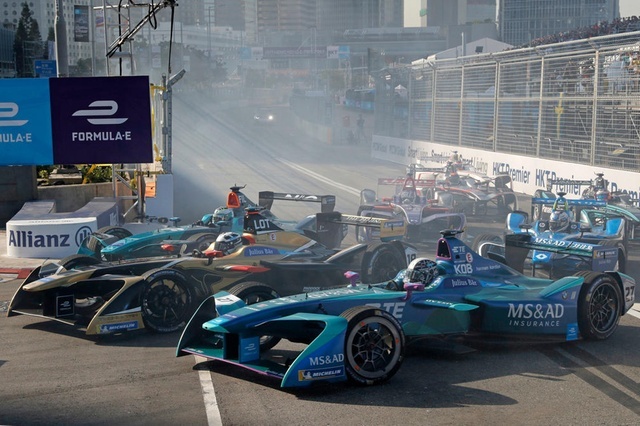 One of the biggest developments in terms of clean or renewable energy being used a sporting sense is the success of Formula E, the environmentally friendly electric version of F1. Formula E is about to enter its 5th season of competitive racers and has boasted a different champion in every one of the first four years, displaying the kind of competitive nature it hopes will appeal to the masses. The technology it takes to develop a battery that enables a car to travel at speeds of up to 174mph is no small feat. Interest in the electric racing has been growing steadily since its inception, though still takes a backseat to the broadcasting and viewing figures of F1; audience figures for the season, Formula E had 61.5 million while Formula 1 had 1.5 billion. For any of the F1 speed freaks out there doubting the excitement of the electric cars, the newly developed Formula E Gen2 car, which will be ready for the upcoming season, boasts a top speed of 174mph, about 50mph behind the highest speeds reached in Formula 1. This is significantly enough for the Formula E cars as they compete almost exclusively on tight, twisty street circuits. Formula E has had some pretty huge endorsements from celebrities over the last couple of years with Richard Branson saying he thinks it could overtake Formula 1 in terms of popularity. Others who have endorsed the sport include: Leonardo DiCaprio, Adrien Brody. Kylie Minogue and Idris Elba. Formula 1 and Formula E represent fantastic opportunities to move sport into a more renewable and more sustainable form. There are still bugs in the system and maybe integration between the two disciplines is the solution, but it’s endearing to see real change and real drive from a sporting organisation to ethically clean up their performance at a time where the world is in critical condition.